We’re big fans of great design. In fact, one of our favorite things about being a general contractor is the ability to make 2D plans become the real, 3D spaces that people live, work, and play in. The concept to reality process is humbling every single time. And offices happen to be where we spend a lot of our time—albeit building them. 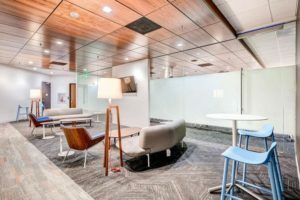 We’ve written before about what it takes to make an office renovation successful and wanted to celebrate and round up a few incredibly successful office renovations in and around Denver. These spaces inspire us and make our work as general contractors really exciting! 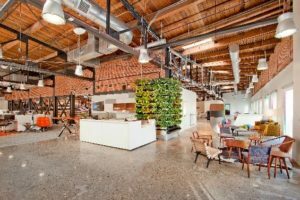 The trend of open concept versus private work space is ever evolving. 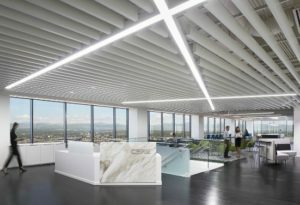 If you’re interested in learning how this is evolving, check out BisNow’s trend update on designing for office. Not surprisingly, these top five are right on target. A few of these offices were built by other contractors, but we find their design so inspiring that we couldn’t leave them out. photo credit: Snyder Building Construction. Used with permission from American Cancer Society. 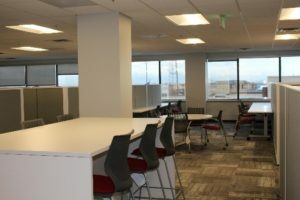 Denver Highlands, at 10065 E. Harvard Ave., and One Denver Highlands, at 10375 E. Harvard Ave., encompass a combined 359,023 square feet of office space. Amenities include an on-site Ink! Coffee shop, walking distance from several fast-casual and casual eateries, and a great view of the Rocky Mountains. Check out the view from several exterior patio decks! American Cancer Society moved their Denver office to the 10065 E Harvard building this year. As a non-profit, the focus is always on the mission. Thus, the design was developed to encourage employee collaboration and celebrate the dedication to the cause. We love their mission! American Cancer Society is on a mission to free the world from cancer. We also love they chose a sustainable lighting package, streamlined their finishes and simplified their look while adhering to their brand. They incorporated outdoor patio access into their suite for a stellar view of the Rocky Mountains. photo credit: Used with permission from Sixth Avenue West. 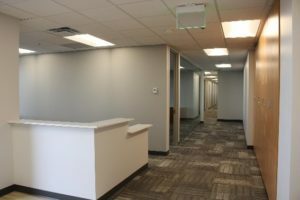 One of the most distinguished office assets in the West Denver submarket is Sixth Avenue West, an eight story, 124,612 square foot Class A office building located in Golden, Colorado. 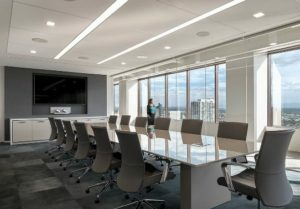 The building boasts attractive floor plates, competitive amenities, outstanding Energy Star Rating, and unparalleled views of Downtown Denver and the Rocky Mountains. 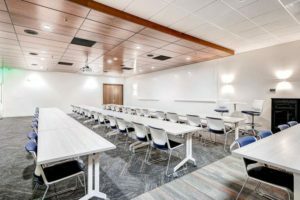 The brand new, state-of-the art conference center (2,392 square feet) with seating for up to 100, blazing fast Wi-Fi, and HD projector, and an attached catering kitchen was designed to modernize the amenity set for all tenants in the building while keeping the space comfortable for large gatherings and small business meetings alike. These upgrades offer lots of flexibility for tenants in the building. Tenants now have access to a café area, fitness center, and smart conference room—all great amenities! The view of Golden and the foothills is stunning all day, but particularly at sunrise and sunset. photo credit: Images courtesy of Dan Vorlage, MicroStar Logistics. The historic Root Building was originally built in 1890 using large wood timber column and beam construction. Today, this building is a staple of the Platte Street neighborhood. Home to several commercial outfits, MicroStar Logistics now occupies the second floor and provides beer keg sales, rentals, service, and logistics for brewers. Creating a fun and unique working environment while reclaiming the historic look and feel of the character of the building in their space was a challenging and critical part of the design. 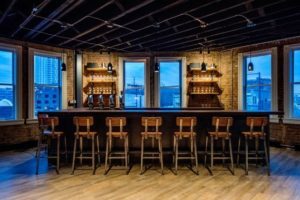 The original exterior brick walls were exposed along with wood ceiling joists and decking to bring back that historic feel to the space. Custom steel and glass storefront systems for the offices and conference areas, custom furniture pieces and millwork round out a unique experience for both employees and visitors. 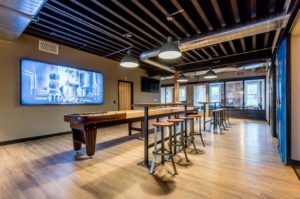 Flexible work space allows employees varied options during the day, as well as access to a custom built shuffleboard table, lounge area, and coffee/beer sampling bar for visiting clients. The space is also highlighted by a full tasting bar featuring some of MicroStar’s clients’ brews on tap. 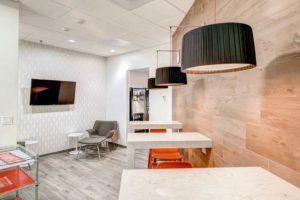 The designer chose a custom, wood-barrel stave accent wall in the reception area which pays homage to the company’s mission. 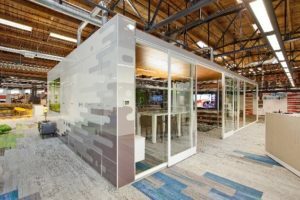 Customized design elements and unique use of the space make this office a great space to spend the day. WorkplaceELEMENTS is an integrated interiors partner that provides a comprehensive portfolio of furniture, manufactured construction, floor coverings, technology, and service solutions for the interior built environment. The Discovery Center provides a forward-thinking space for our employees to work and thrive in addition to showing our clients and prospects the full array of our product and service-based solutions. We want to demonstrate how the workplace can contribute to achieving the most significant organizational goals: The attraction and retention of key talent, the maximization of productivity, and the right physical environment to promote innovation throughout an organization. Open ceilings exposed original wood and beams, exposed brick and an open feel makes you feel cozy in a large space. 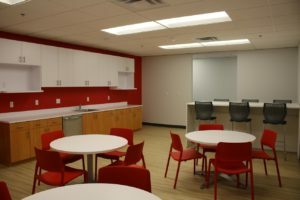 Additionally, the flex space throughout caters to employees’ needs for both collaboration and independent work. 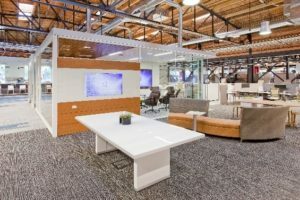 A bonus from visiting, the furniture and finishes in The Discovery Center sample what WorkplaceELEMENTS has to offer—thus employees really get to experience their products before designing them into new spaces. CBRE is the world’s largest commercial real estate services and investment firm with five offices across the Front Range offering a broad range of integrated services, including facilities, transaction and project management; property management; investment management; appraisal and valuation; property leasing; strategic consulting; property sales; mortgage services and development services. 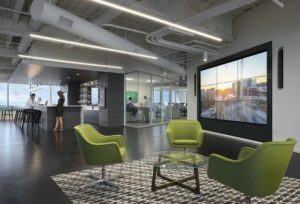 CBRE’s downtown Denver office is part of the firm’s global Workplace360 initiative designed to maximize employee collaboration, mobility and productivity through technology-enabled, free-address and paperless offices. First and foremost, the view of the Rocky Mountains is spectacular which makes it extra special for those who live and work here in Colroado. Second, the open floor plan mixed with sleek amenities and beautiful finishes make this one to remember. 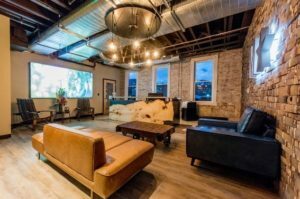 Located right in the heart of Downtown Denver, this office definitely tops out our list. We’re proud to have served as the general contractor for both American Cancer Society and the Sixth Avenue West buildings. Interested in working with us? Give us a call at 720.900.5082 or email us at info@snyderbuilding.com.